(01/20/16) World Documentary Awards (WDA) finally announced its Best Film on Monday, January 18, 2016. 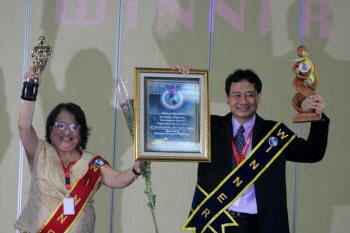 The Awards Ceremony was held in the auditorium of Radio Republic of Indonesia (RRI). The event was attended by filmmakers from outside and inside the country, official parliament members, Human rights activists and journalists. Natasha Dematra as one of the festival jurues said “This film deserves the title of Best Film not just because of its strong theme but because it was well executed and can inspire future generations". This festival works together with International Film and Photography Festival (IFPF), Animation Awards (WAA) dan World Human Rights Award (WHRA). According to Dedeh Kurniasih, the chairwoman of People's Creative Council, this festival is being held by People’s Creative Council, iHebat International Volunteers, Russian Culture Centre, Care for Children Foundation, World Film Council, and Radio Republic of Indonesia as the media partner and organiser.